Valued as an ornamental plant, due to its colorful and attractive flowers. 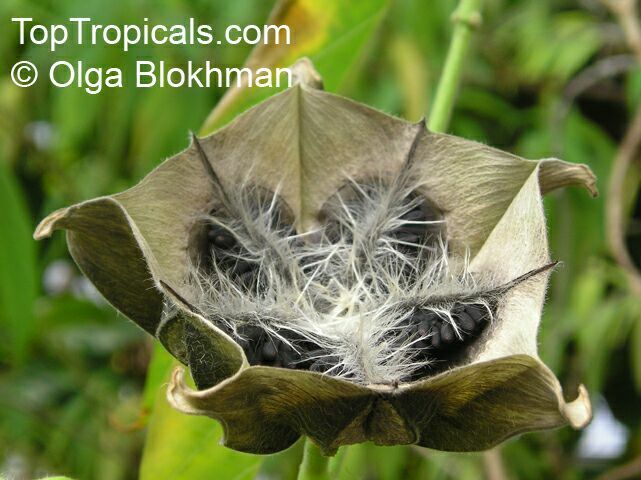 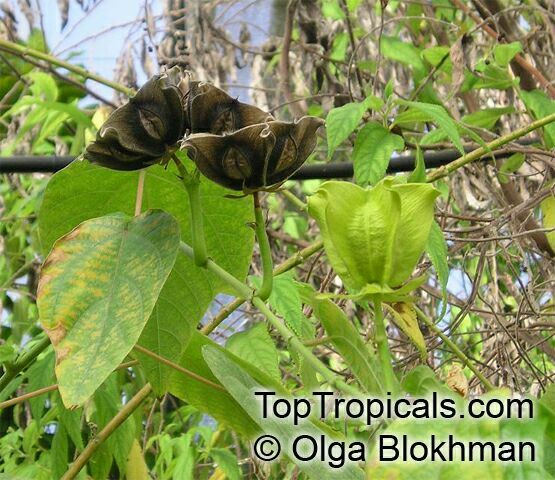 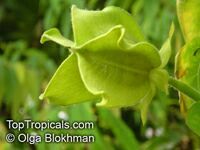 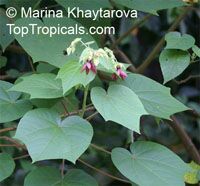 The leaves are alternate, rough, hairy, heart-shaped or 3-5 lobed with serrated margins. Flowers are Hibiscus-like. 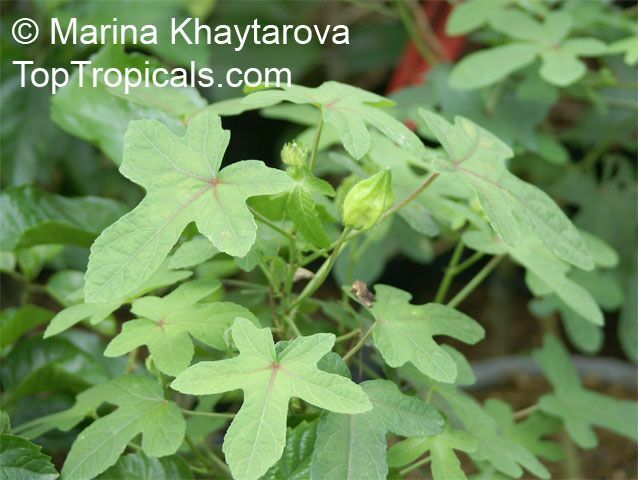 Cultivated for aromatic oil from seeds. 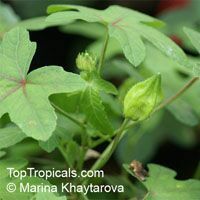 Young leaves, shoots, and unripe seedpods are cooked as a vegetable. 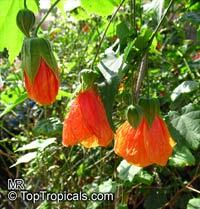 Brazilian Bell-flower is a fun and easy-to-grow hummingbird magnet for the perennial border. 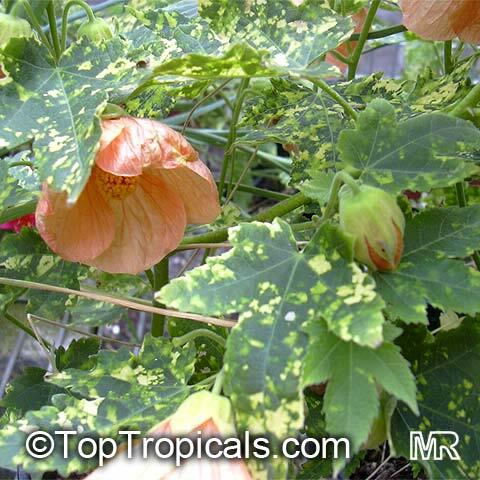 In the garden or in a hanging container, it spreads to several feet wide in a single season. 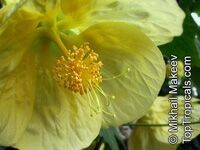 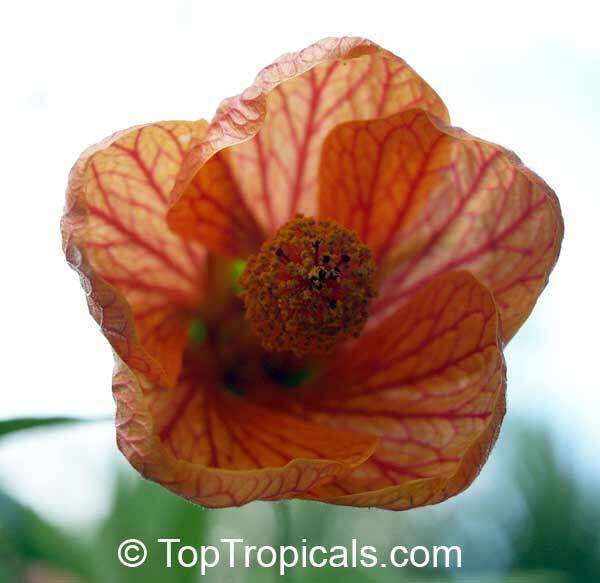 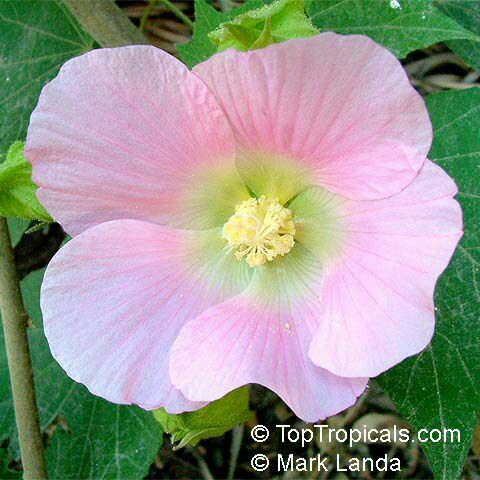 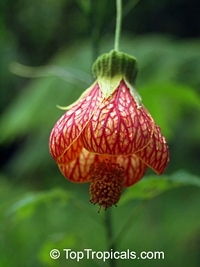 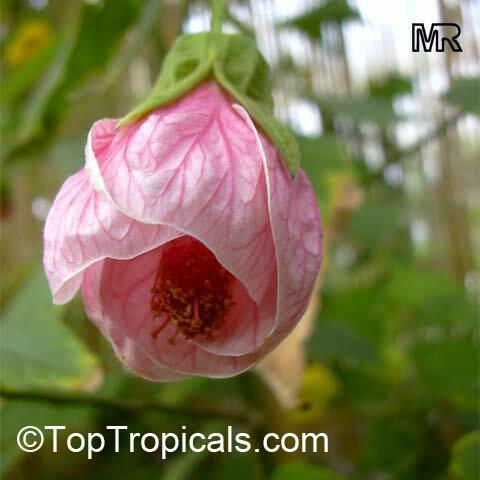 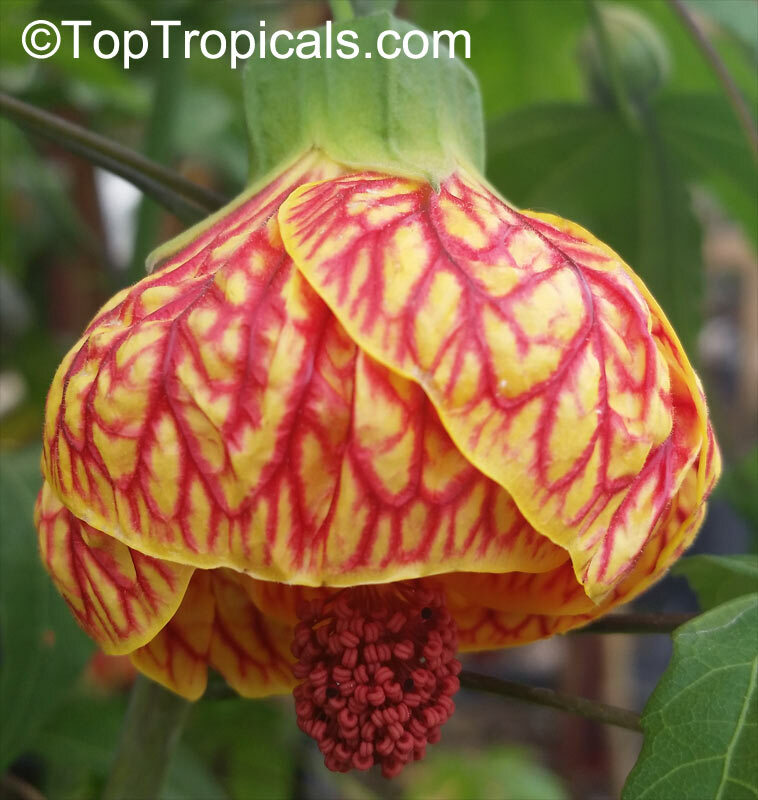 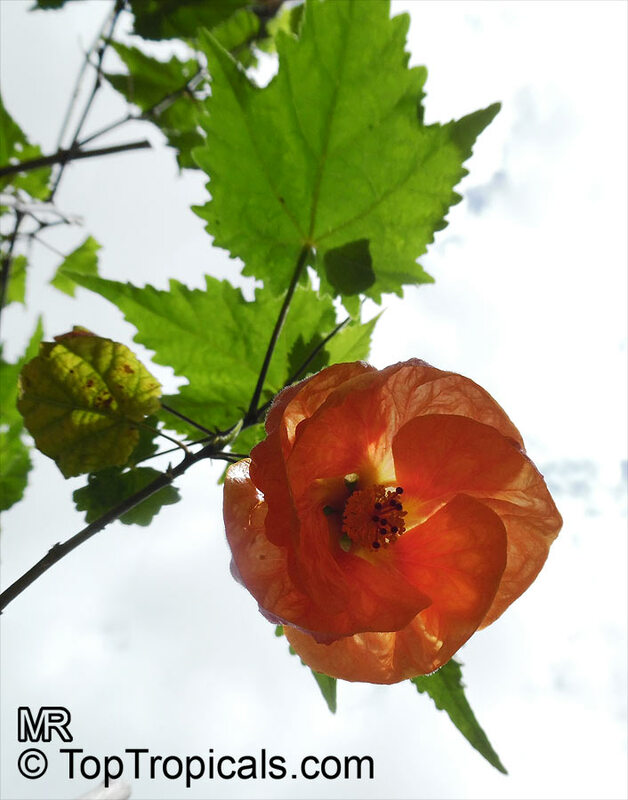 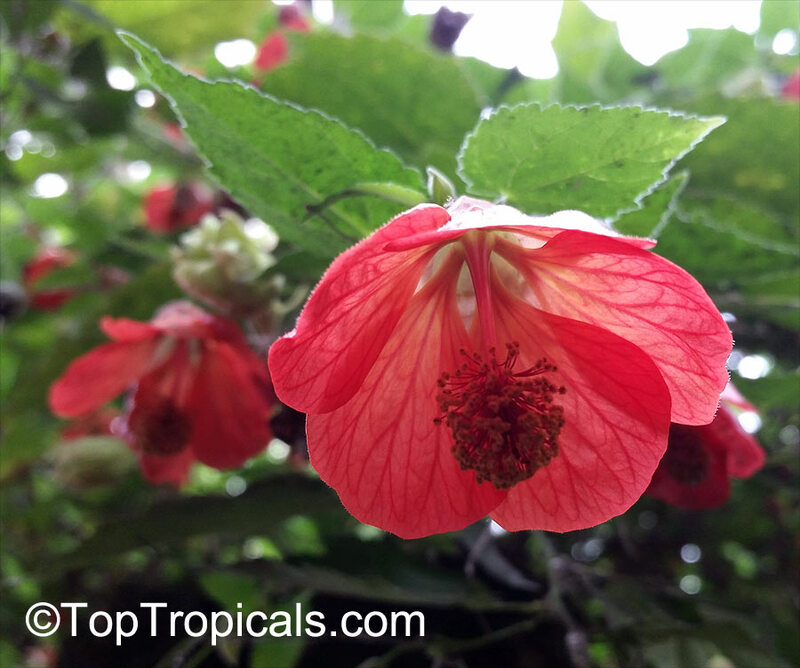 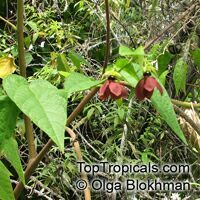 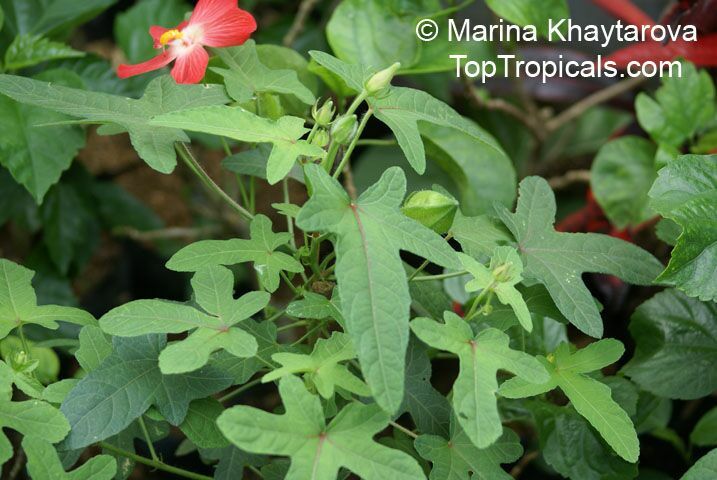 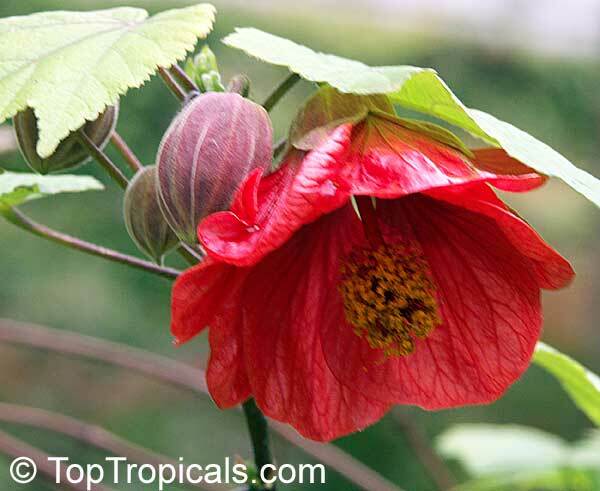 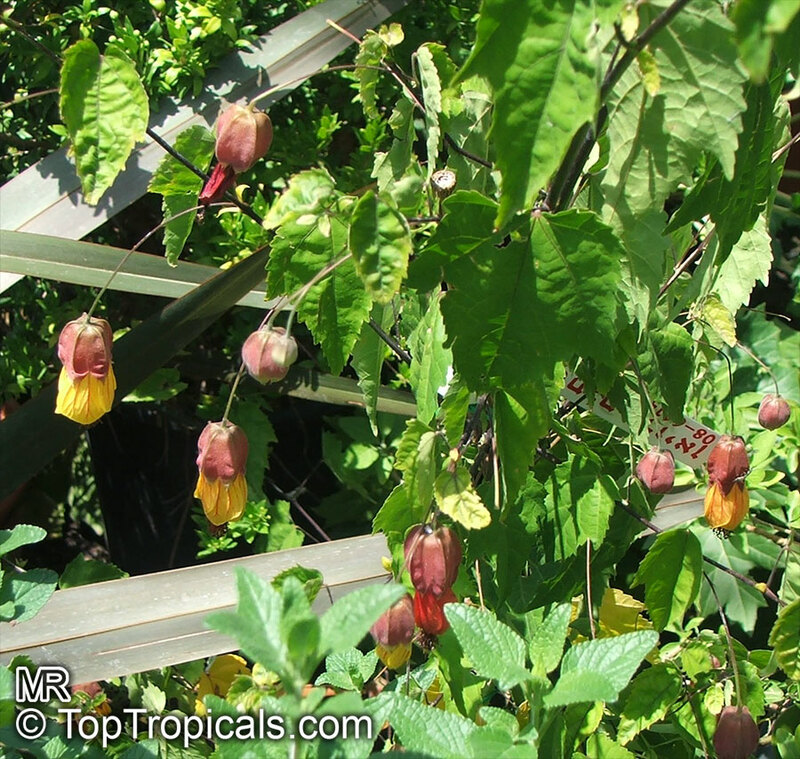 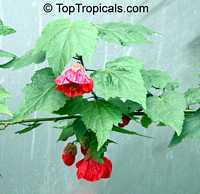 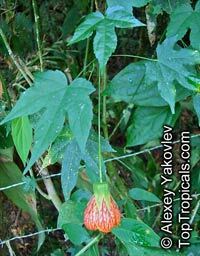 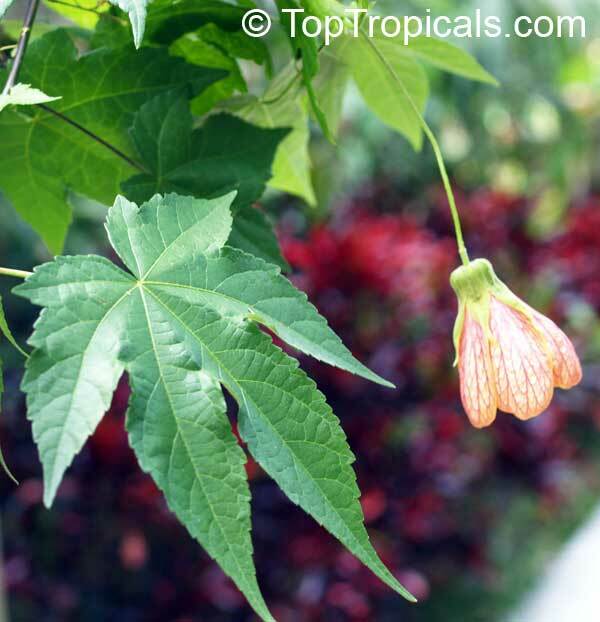 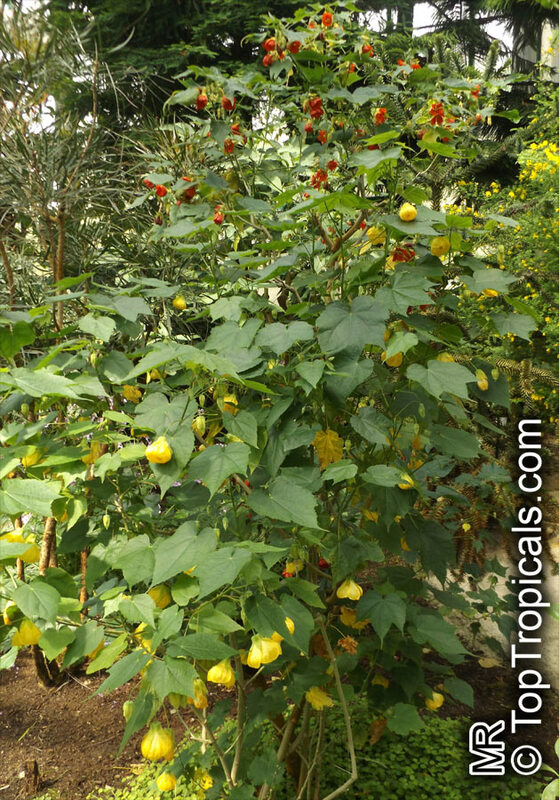 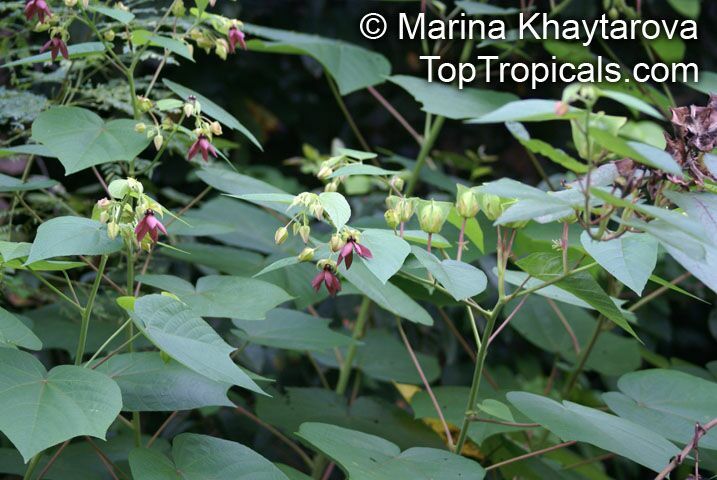 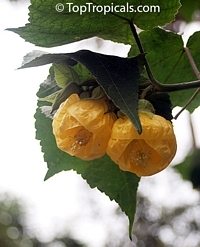 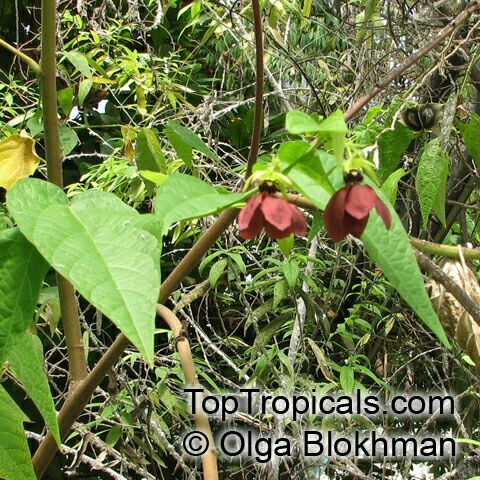 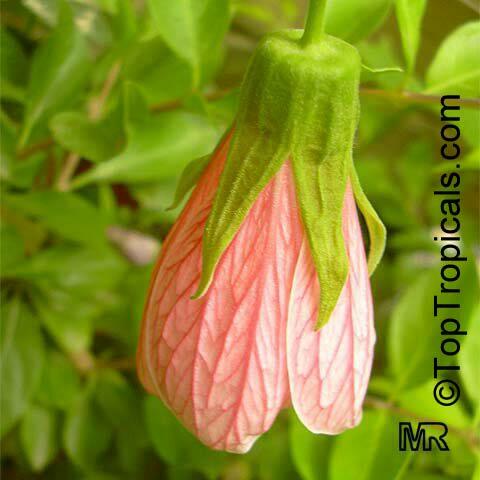 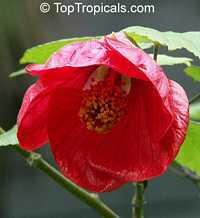 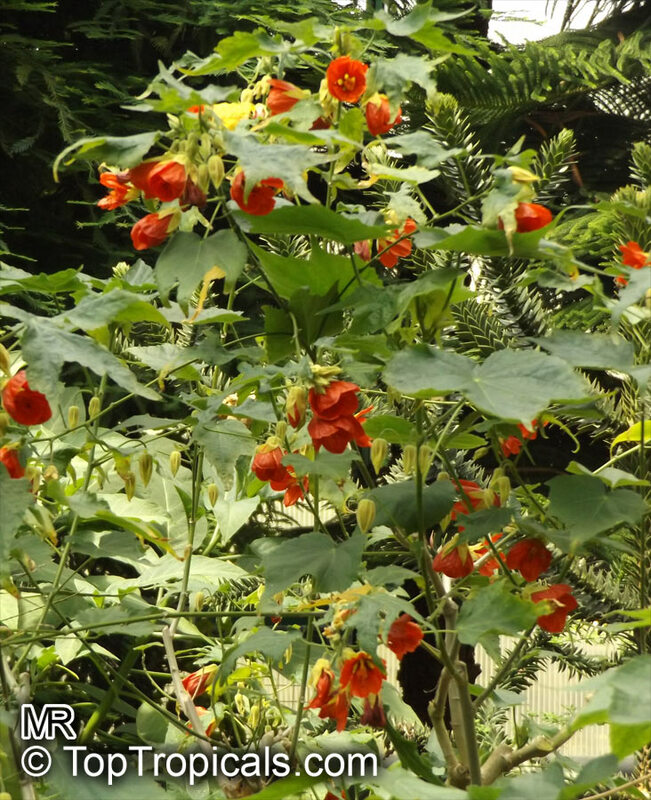 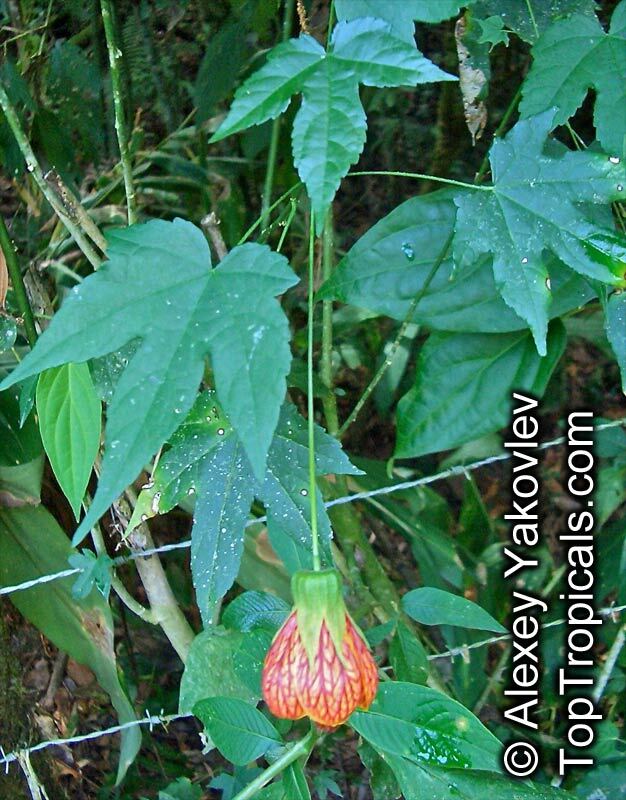 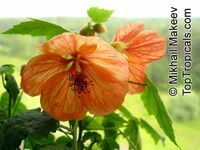 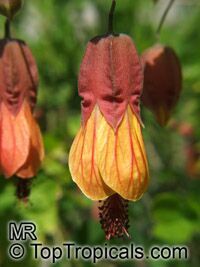 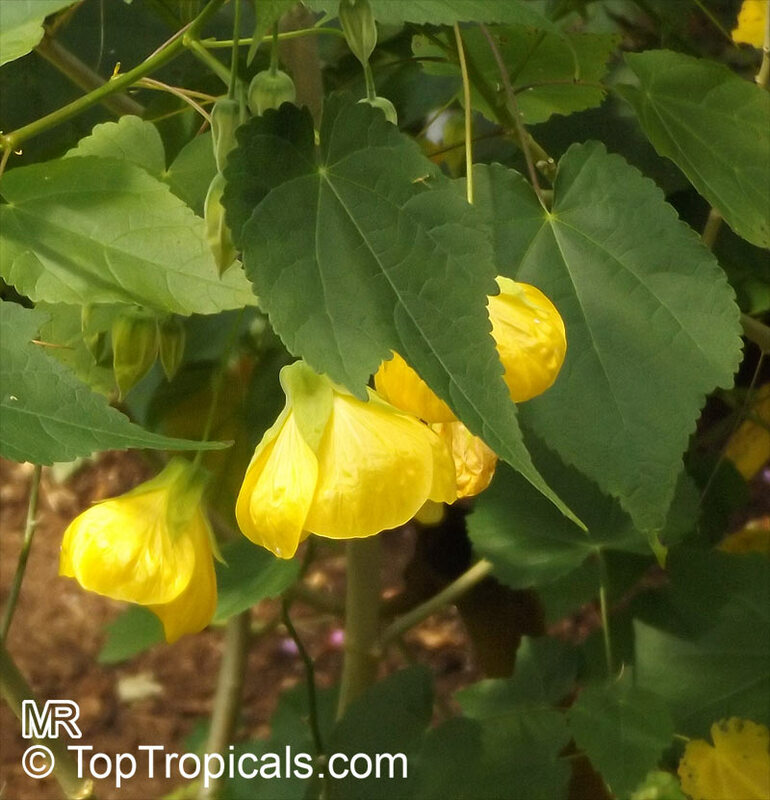 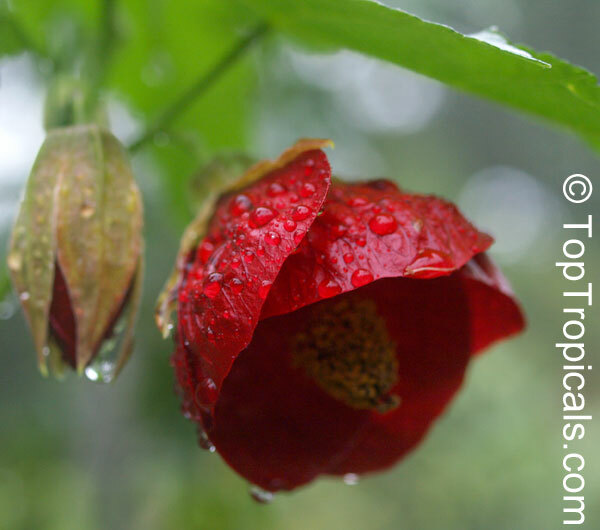 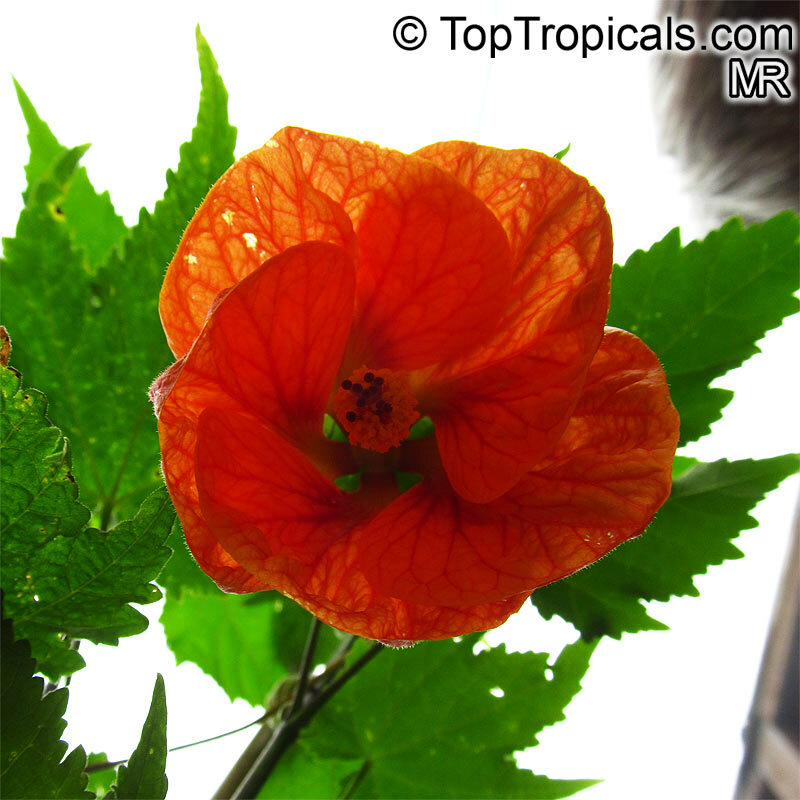 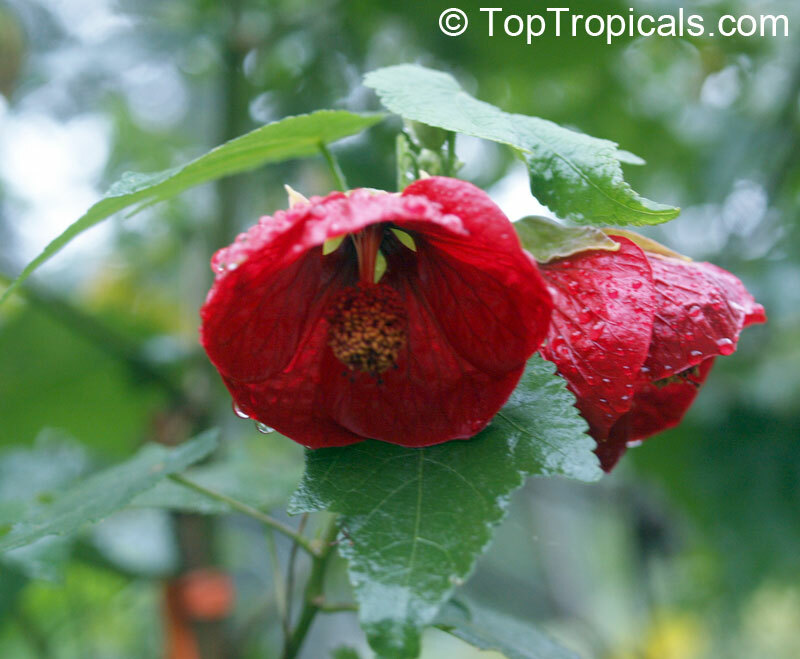 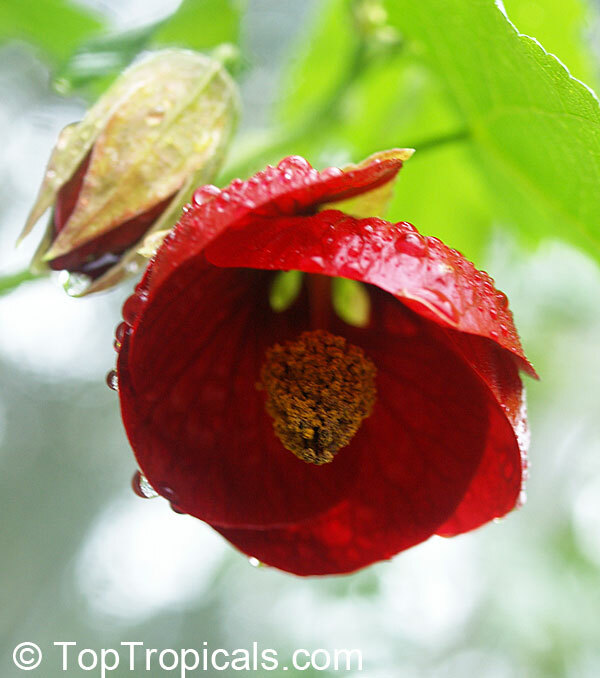 In the wild, Abutilon megapotamicum reaches 8' tall, but in cultivation arely exceeds 5' tall, and less when grown as a potted plant. 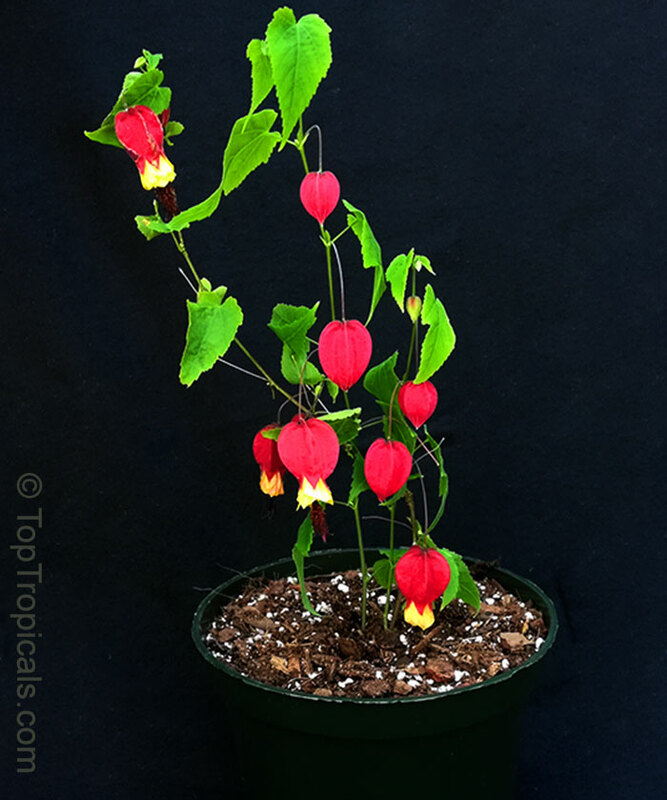 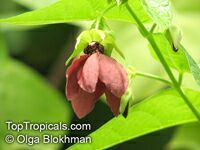 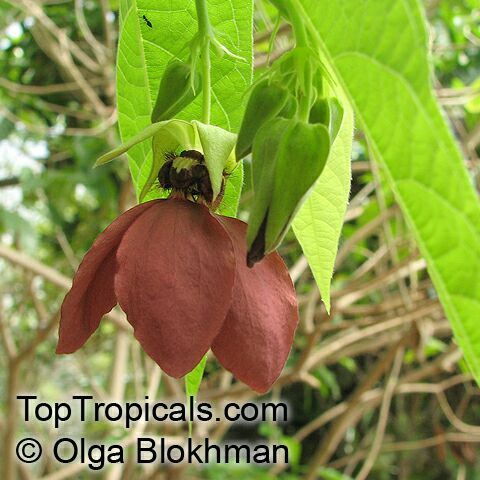 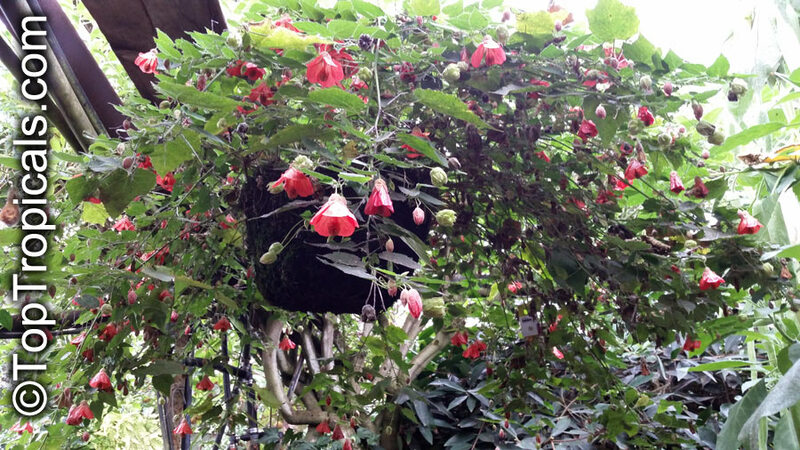 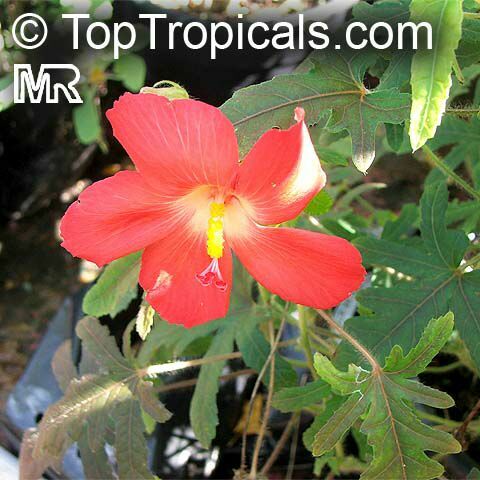 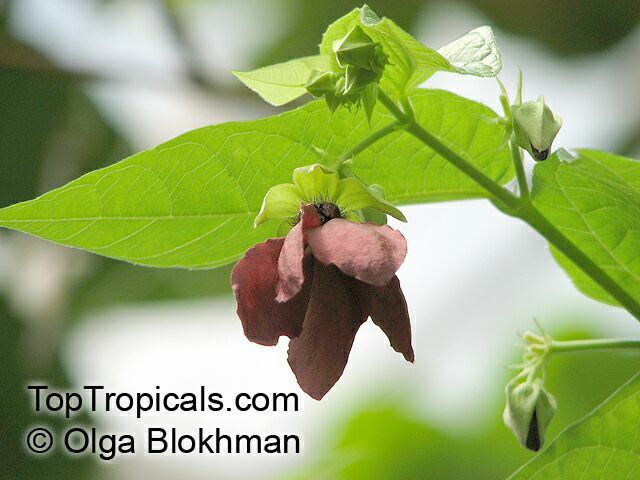 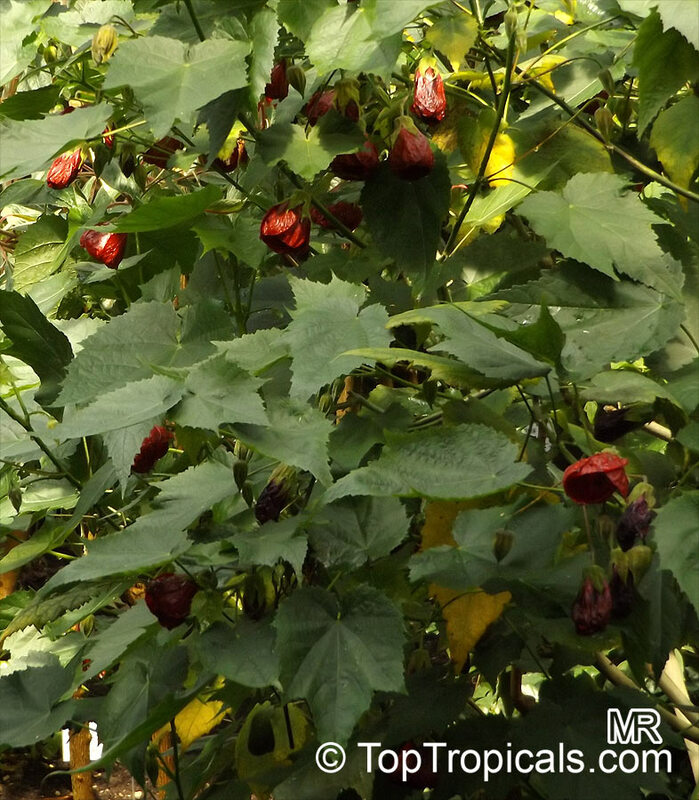 During warm months, the plants are laden with cool 2" hanging lantern-like flowers composed of red calyces above the yellow petals, ending with its bright red privates dangling beneath... all carefully arranged between the thumb-sized green leaves. 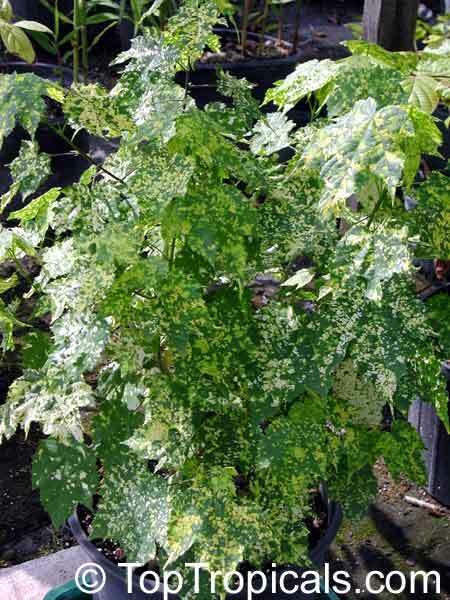 Variegated form. 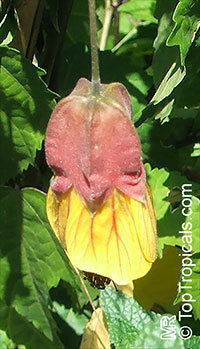 Brazilian Bell-flower is a fun and easy-to-grow hummingbird magnet for the perennial border. 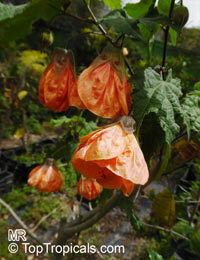 In the garden or in a hanging container, it spreads to several feet wide in a single season. 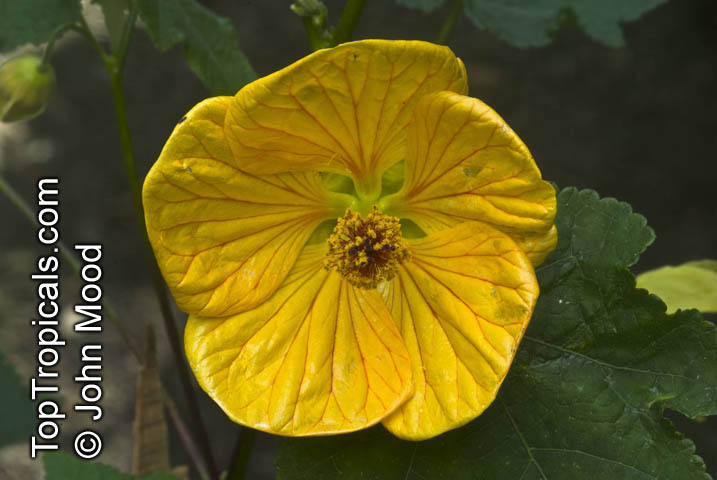 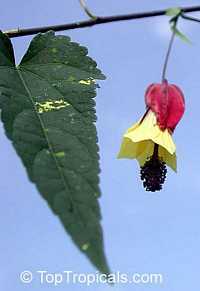 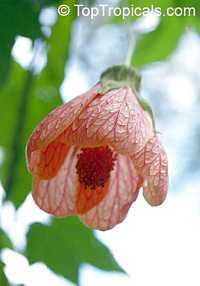 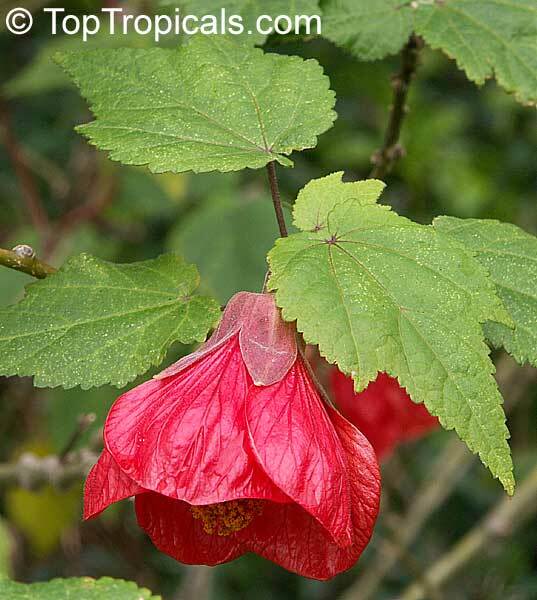 In the wild, Abutilon megapotamicum reaches 8' tall, but in cultivation rarely exceeds 5' tall, and less when grown as a potted plant. 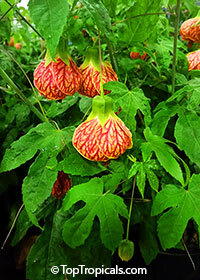 During warm months, the plants are laden with cool 2" hanging lantern-like flowers composed of red calyces above the yellow petals, ending with its bright red privates dangling beneath... all carefully arranged between the thumb-sized green leaves. 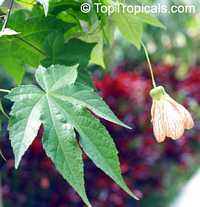 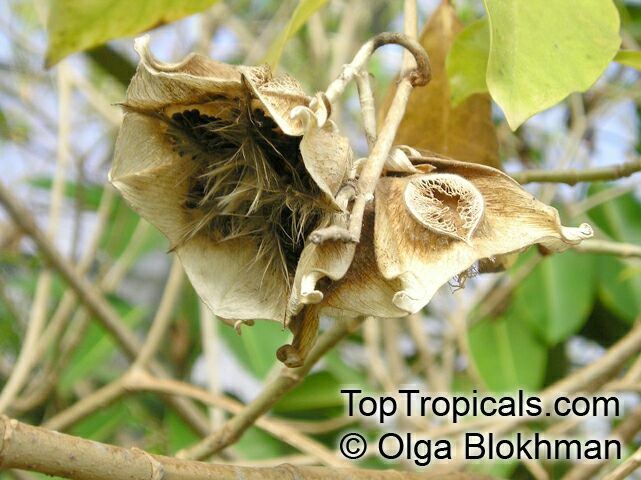 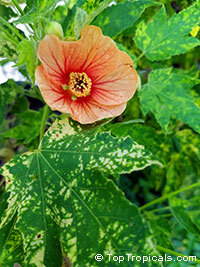 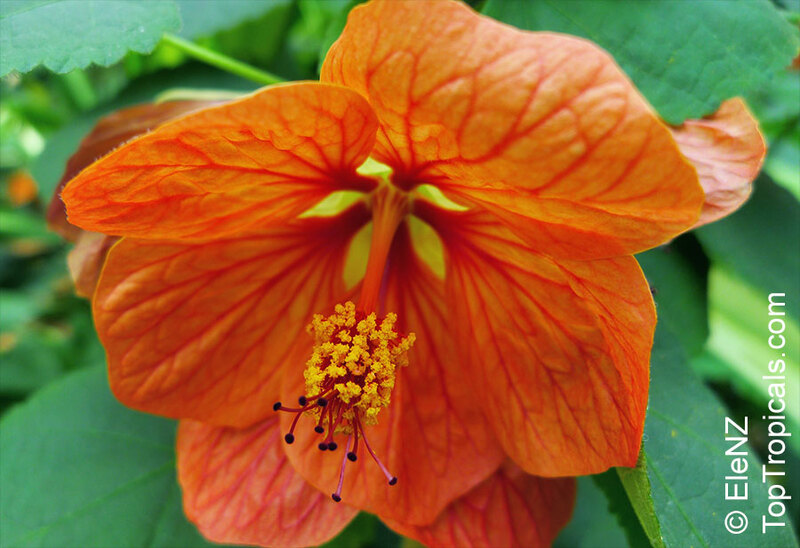 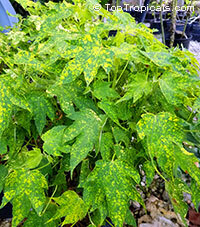 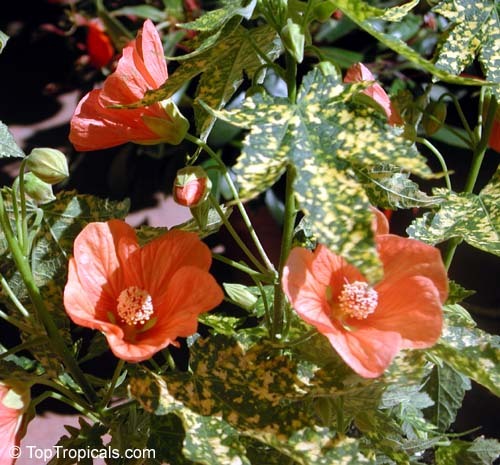 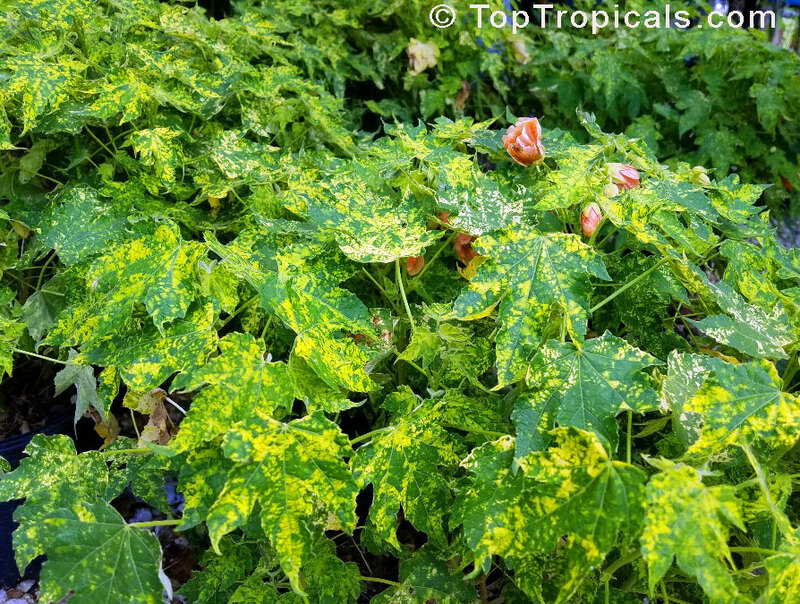 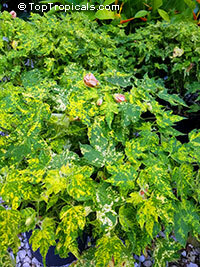 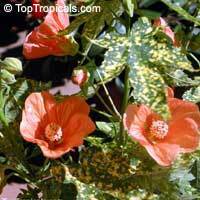 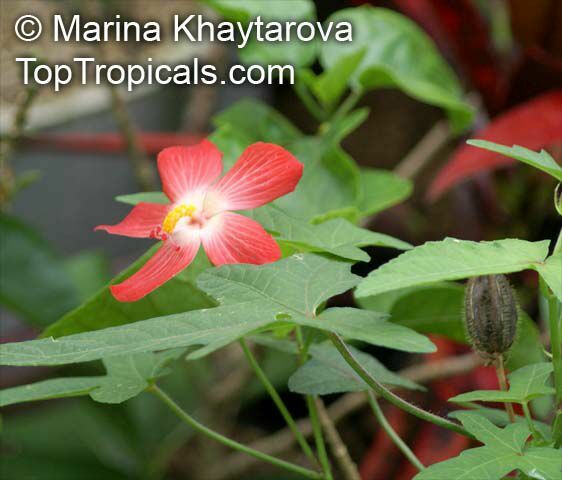 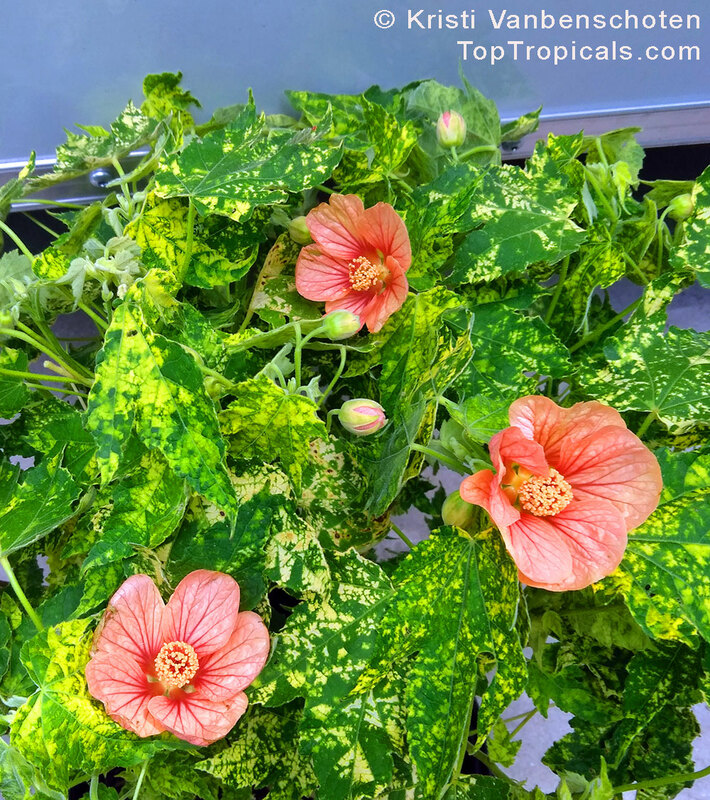 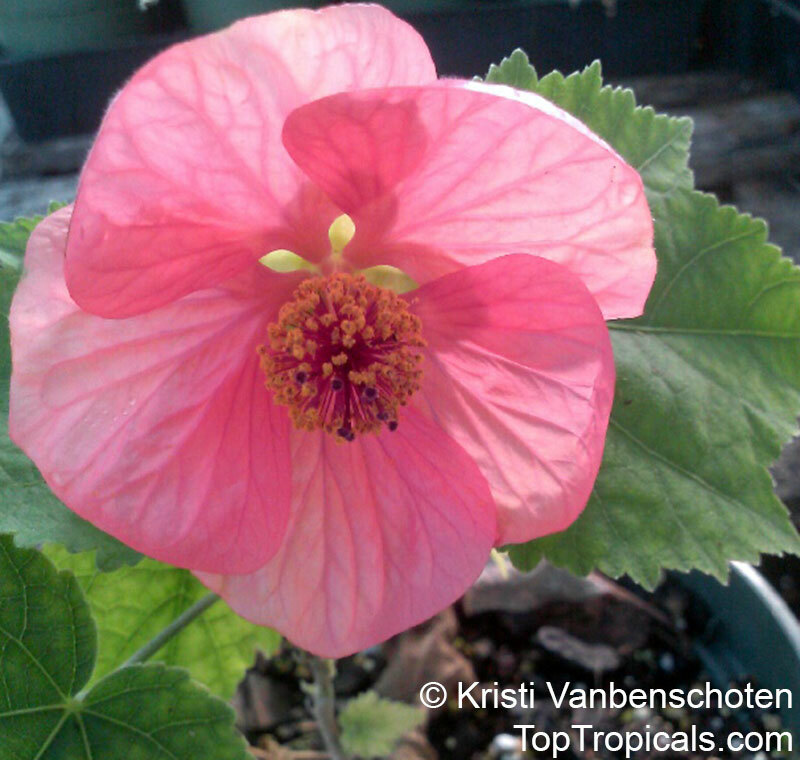 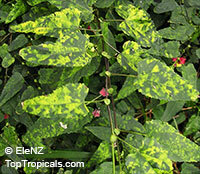 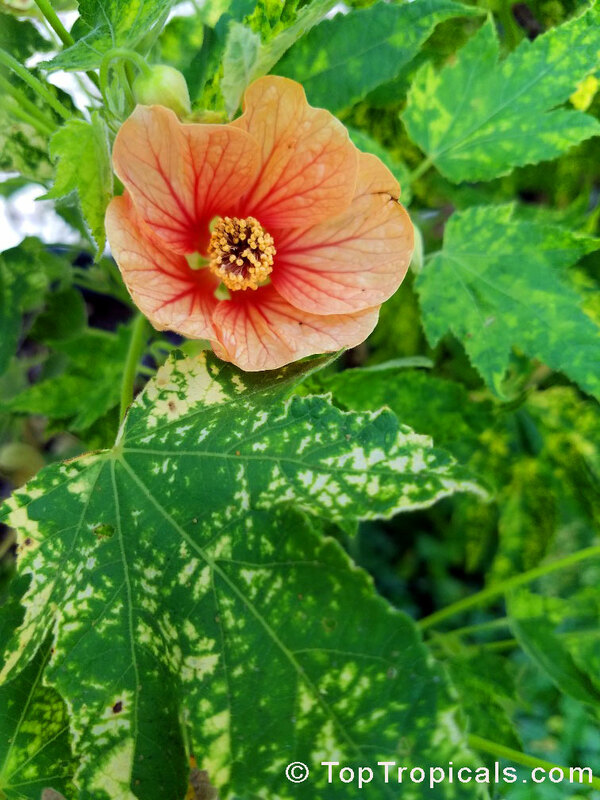 Abutilon pictum is a fast-growing tropical flowering shrub is prized for its speckled, maple-shaped leaves and showy, coral-orange flowers. 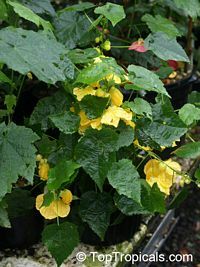 A beautiful accent or border shrub in frost-free areas, with an upright form that is easily espaliered against a wall. 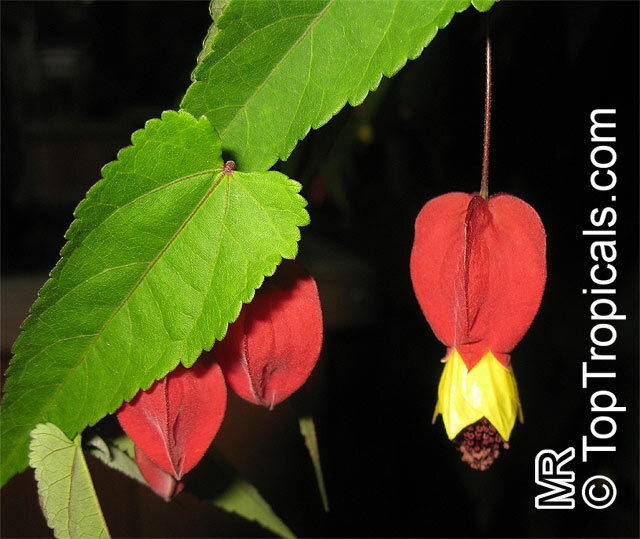 A showy container accent in bright patio or indoor locations, fun and easy-to-grow hummingbird magnet for the perennial border. 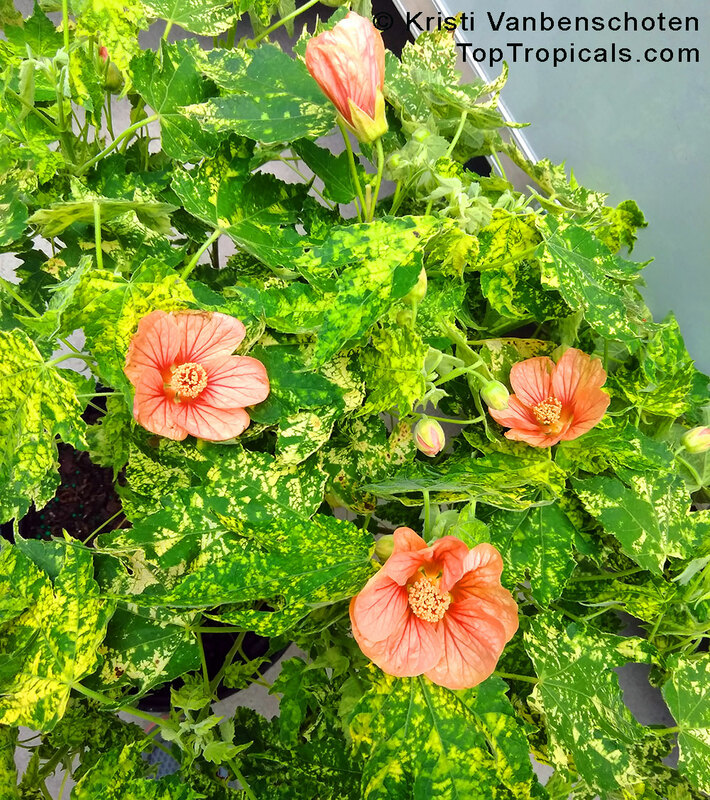 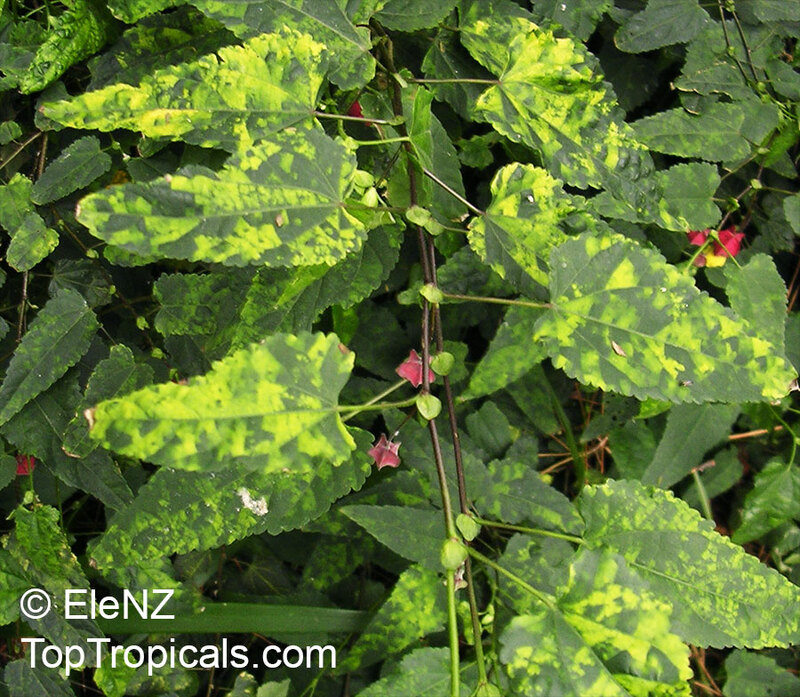 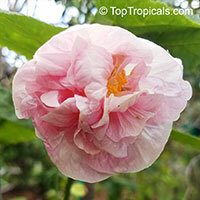 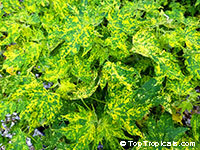 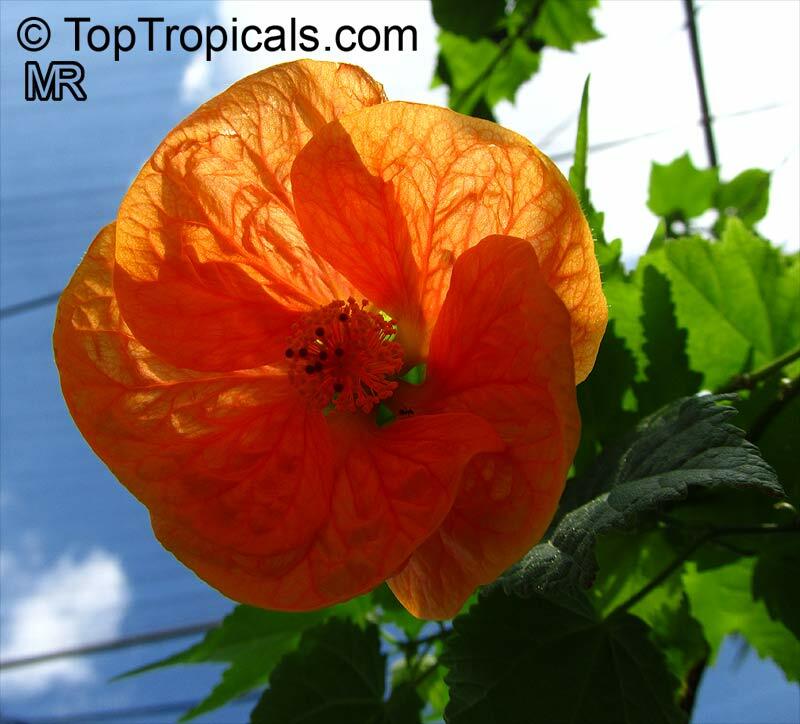 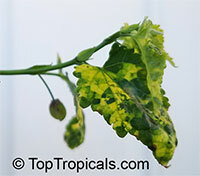 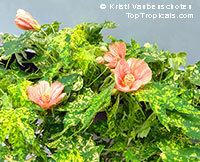 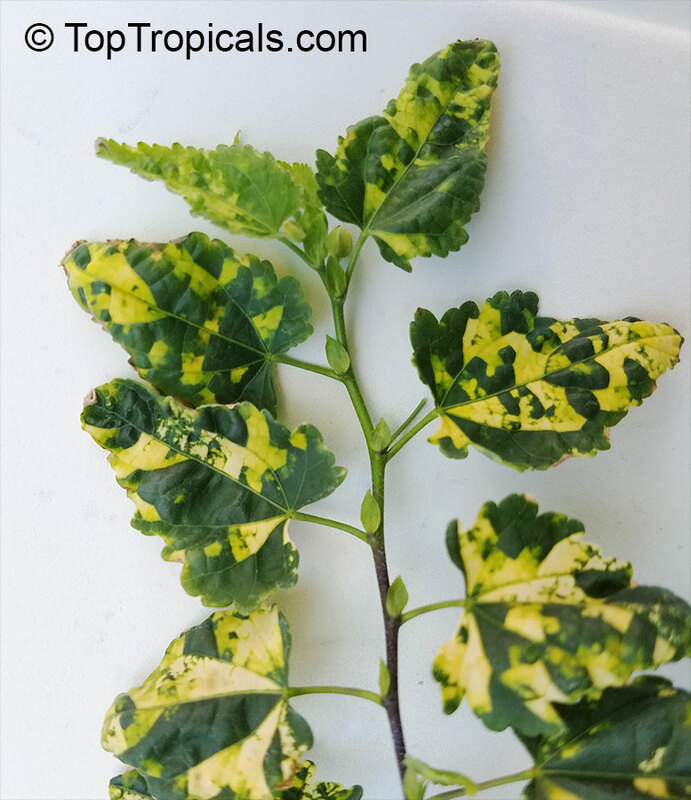 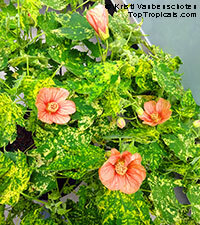 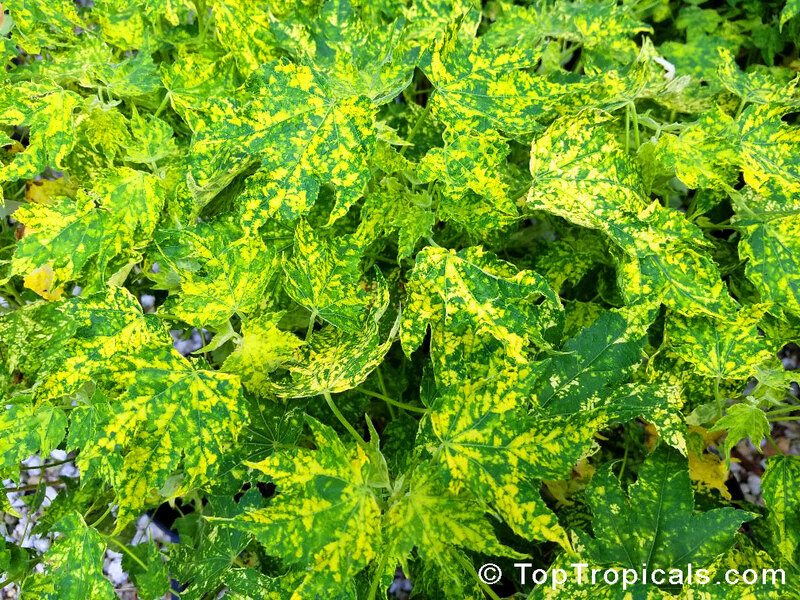 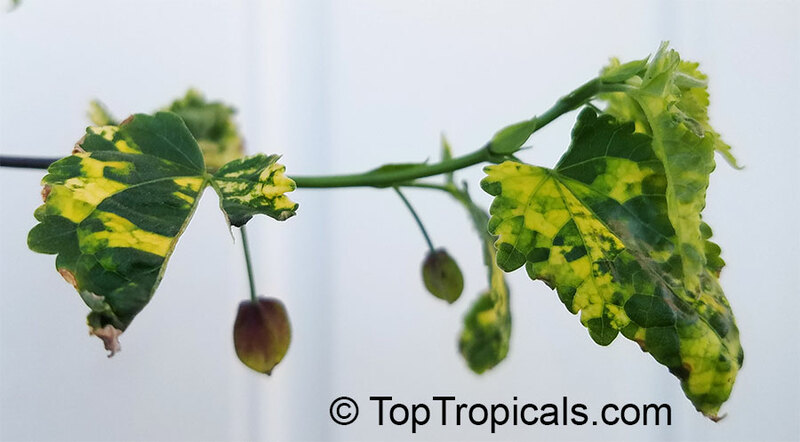 Thompsonii is a showy variety with golden leaf variegation and peach colored flowers with red veins. 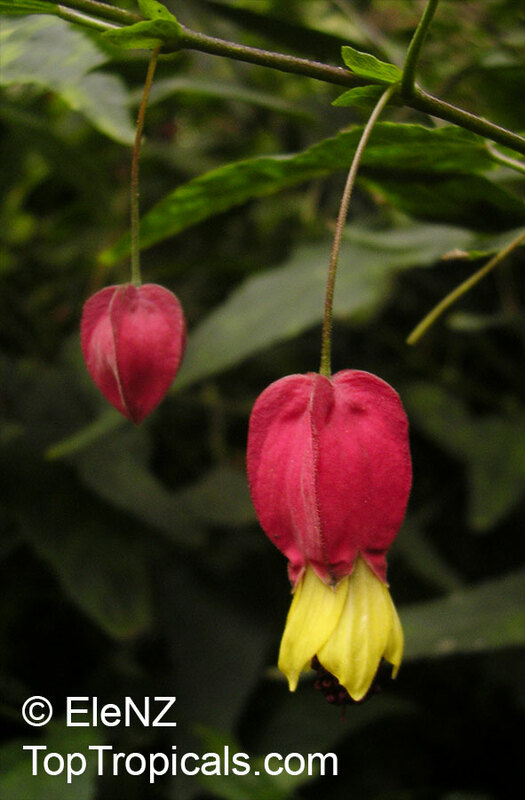 Great container specimen. 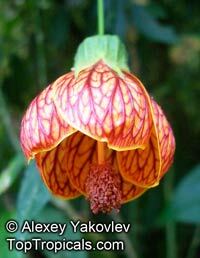 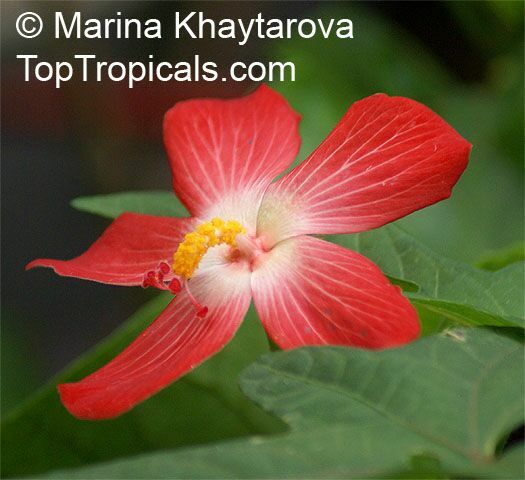 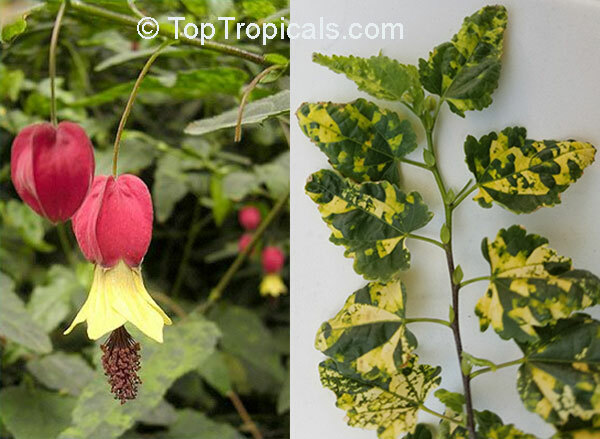 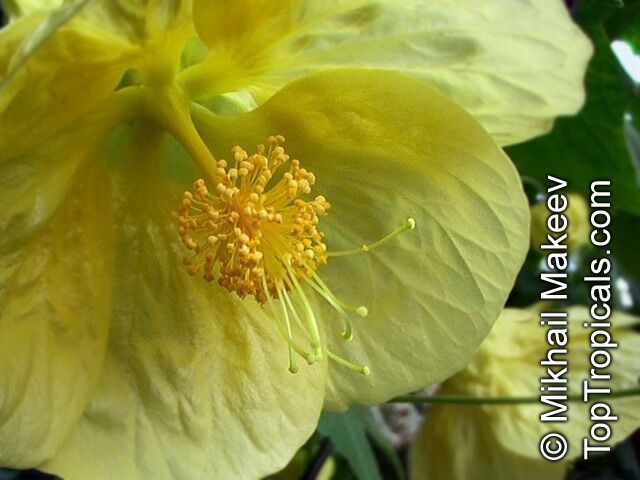 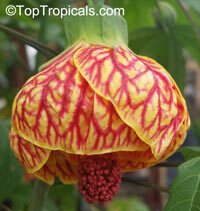 Abutilon x hybridum is a collective name for several varieties. 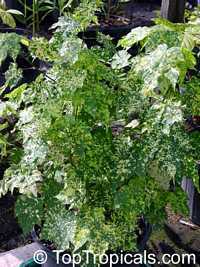 Upright, arching growth with maple-like foliage. 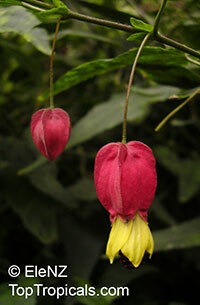 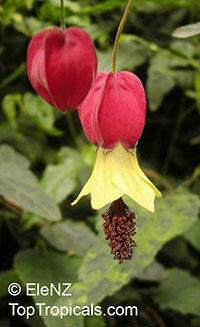 Drooping, lantern-like blooms in white, yellow, pink or red in spring. Forms a natural trellis-like shape without training. 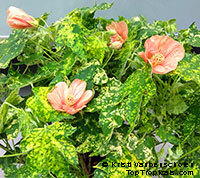 This is a great container plant. 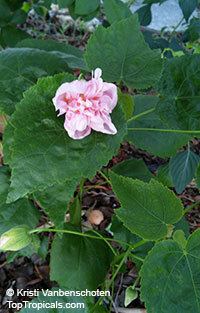 Prune in early spring, and pinch tips to keep bushy. 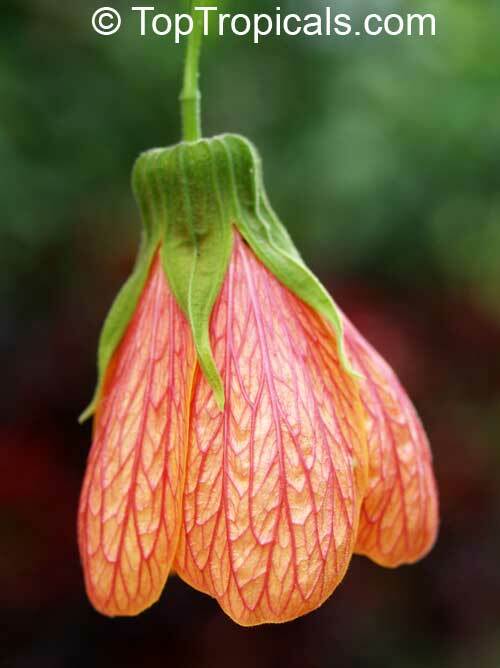 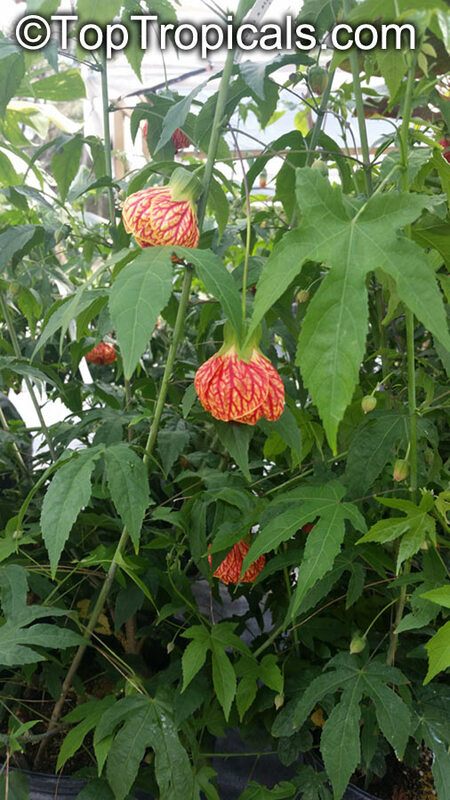 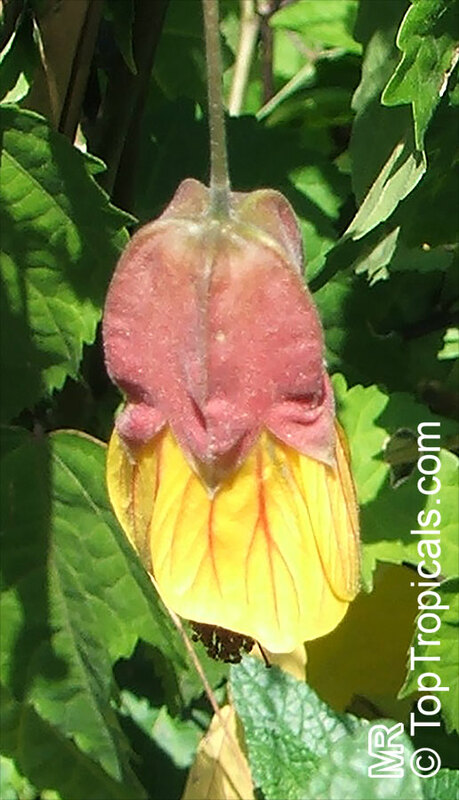 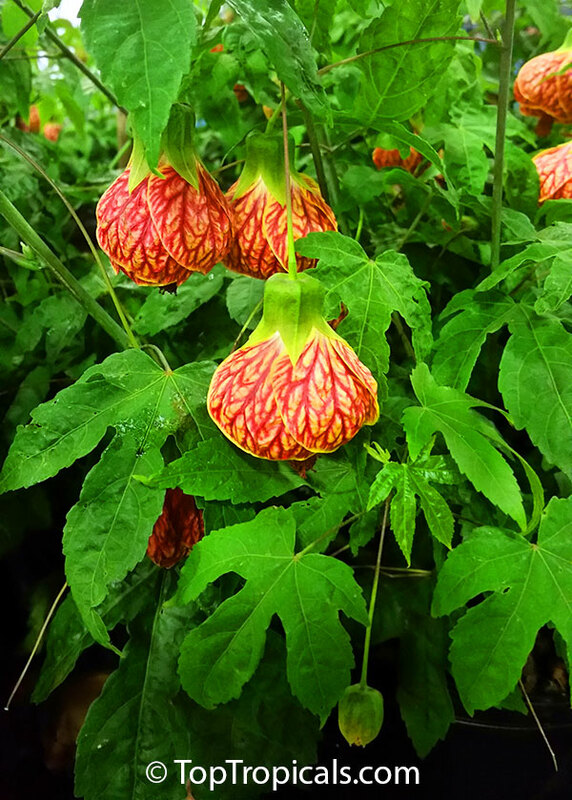 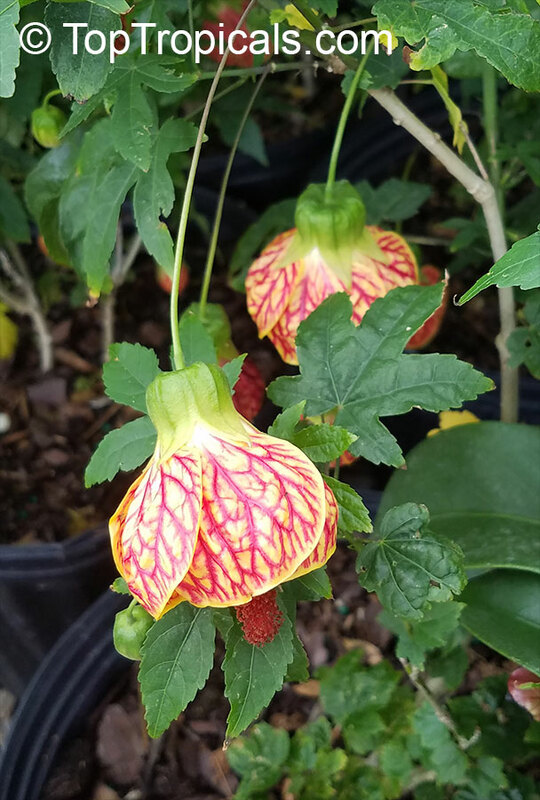 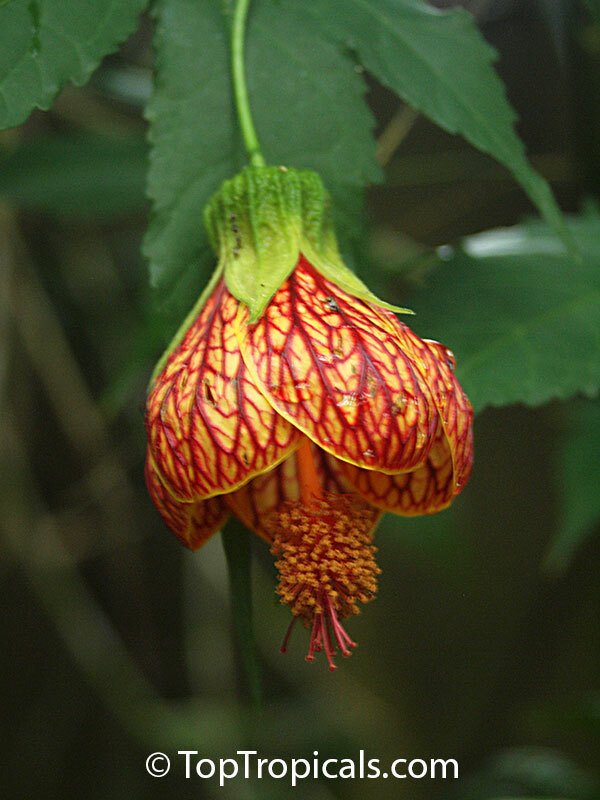 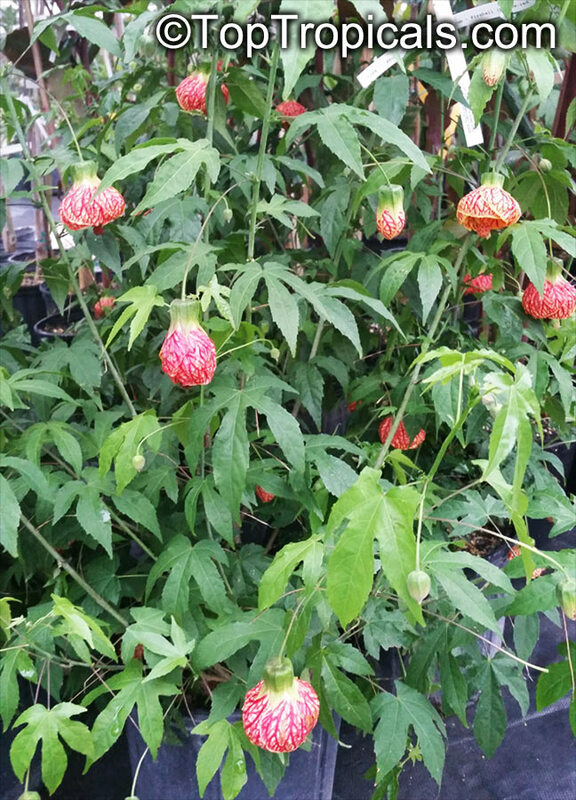 Also known as A. x hybridum Fireball, and Abutilon Biltmore Ballgown, this is one of the many lovely hybrids between A. darwinii and A. striatum, with maple-like leaves and bell-flowers whose petals are recurved, turning in slightly at the bottom. 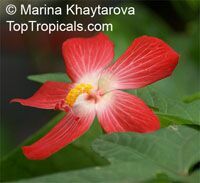 Flowers are fiery red, as one would imagine, with prominent red veins accenting the surface. 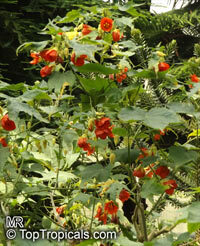 Happy plants can reach 8-10 ft tall, though pruning easily adjusts the size. 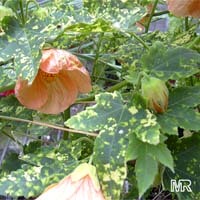 Best with plentiful summer water and fertilizer. Less hardy than many, preferring temperatures that only occasionally drop into the 20s F, USDA zone 9. Placement out of wind with overhead protection and plentiful mulch help in less than balmy climates. 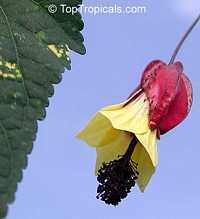 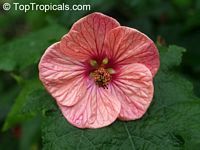 The double pink blooms of Abutilon Victorian Lady arise from spring to fall on the upright branches of this fast, vigorous hybrid. 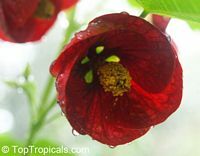 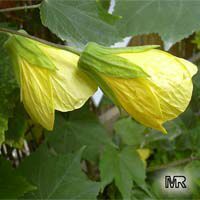 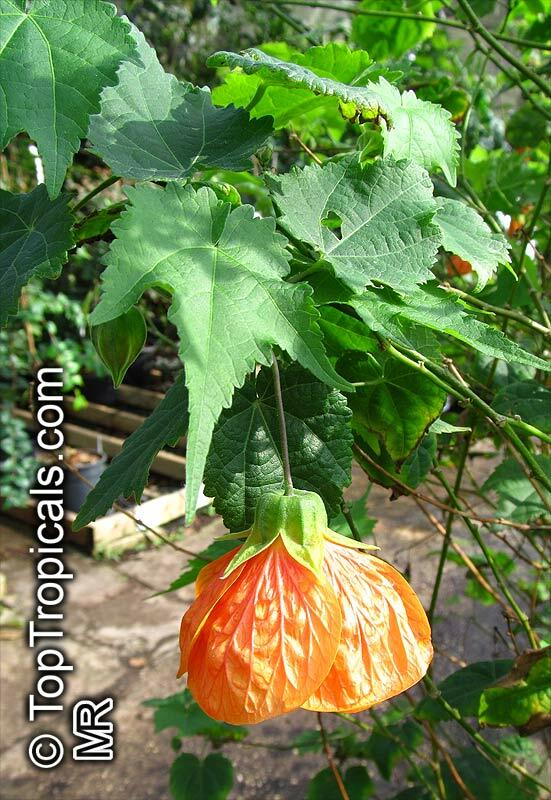 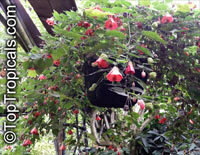 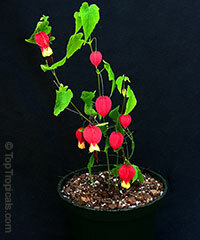 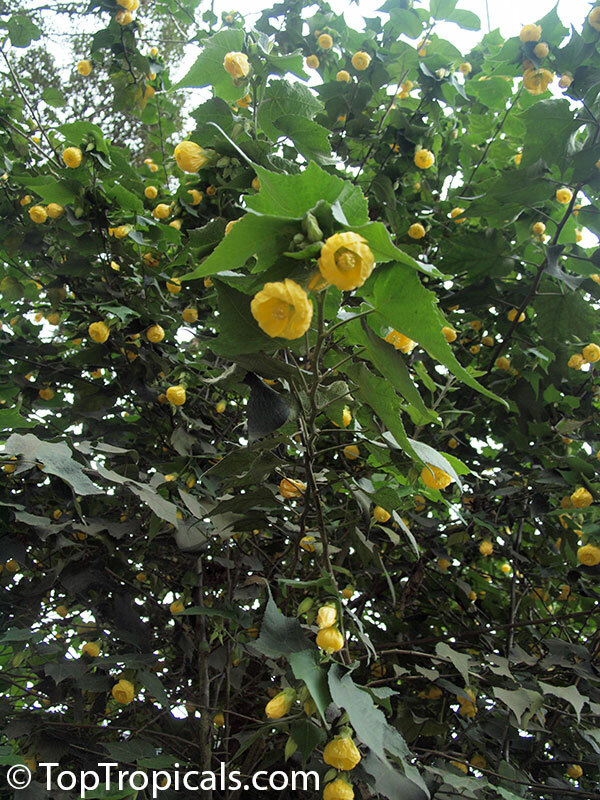 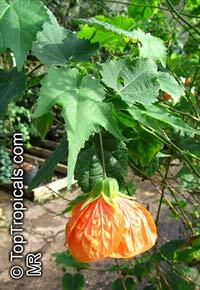 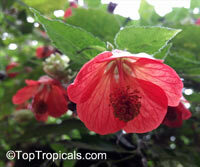 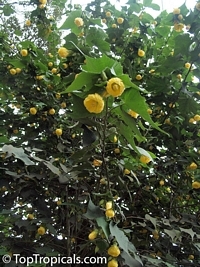 Unusual in the world of abutilons, the 2" blooms have ruffled, double petals. It's a tall grower that takes well to hard pruning whenever the plant has outgrown its pot.